Standard Unix permissions might not be enough for some organisations. This chapter introduces access control lists or acl's to further protect files and directories. 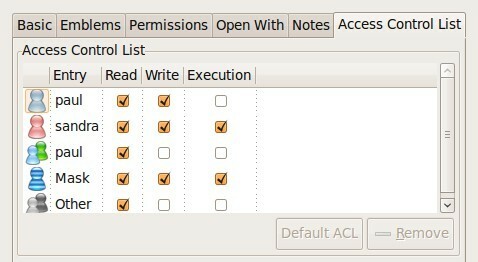 File systems that support access control lists, or acls, have to be mounted with the acl option listed in /etc/fstab. In the example below, you can see that the root file system has acl support, whereas /home/data does not. Reading acls can be done with /usr/bin/getfacl. This screenshot shows how to read the acl of file33 with getfacl. Writing or changing acls can be done with /usr/bin/setfacl. These screenshots show how to change the acl of file33 with setfacl. First we add user sandra with octal permission 7 to the acl. Then we add the group tennis with octal permission 6 to the acl of the same file. The result is visible with getfacl. The -x option of the setfacl command will remove an acl entry from the targeted file. Note that omitting the u or g when defining the acl for an account will default it to a user account. The -b option of the setfacl command will remove the acl from the targeted file. The acl mask defines the maximum effective permissions for any entry in the acl. This mask is calculated every time you execute the setfacl or chmod commands. You can prevent the calculation by using the --no-mask switch. Desktop users might want to use eiciel to manage acls with a graphical tool. You will need to install eiciel and nautilus-actions to have an extra tab in nautilus to manage acls.